Majorium has researched and developed its innovative Integrated Multicast Learning technology to produce the results CEOÂ?s are demanding from their training departments. For every dollar companies invest in the Majorium sales training method, most average a two hundred dollar increase in new sales that is generated from the direct application of the concepts taught by the training. Â Intensive training events overwhelm most sales people. They receive entirely too much information to digest, analyze and comprehend. By the time the training event ends, everything is blurred. Once sales people return to their territories, surveys continually demonstrate that they remember less than ten percent (10%) of what they initially were taught. The purpose of training must be to change sales peopleÂs behavior in a way that produces positive results and more sales. Without an educational structure that teaches and reinforces specific concepts, many will never be retained. New approaches to enhance them will never be tried. Without retention, sales people cannot transfer and apply what they learned. Only with on-going application can results be produced and sustained. Training that is delivered in shorter concentrated bursts, which allows it to be digested in small blocks of time, is most effective. Sales people can easily remember what is taught if lessons are reinforced step-by-step and are sequential in their development. This is the only way to attain concept proficiency and mastery. Additionally, when training is blended with event-based workshops and discussion groups, it tends to drive the training further into organizational cultures. When linked with testing that holds trainees accountable, companies find it produces sustainable results. Majorium, an innovative and emerging information technology company, has learned to harness cheap technology to profitably deliver sales training for $75.00 per participant. Its standard sales training program includes three months of comprehensive blended training lessons, group discussion activities and monthly testing and evaluation. It is able to do this without sacrificing the overall quality and the results it produces. 1. Self-directed sales training lessons are delivered three times per week in PDF format. 2. Lessons are delivered directly to each participantÂs desktop computer. The training is brought to sales people. It can be printed and read, while waiting for an appointment or to fill downtime. 3. There is no need for sales people to logon to a website and be compelled to spend hours to complete their training. 4. Training can be delivered simultaneously to geographically dispersed sales forces. 5. Training is conducted at the userÂs convenience in short blocks of time, usually less than 20 minutes per lesson. 6. 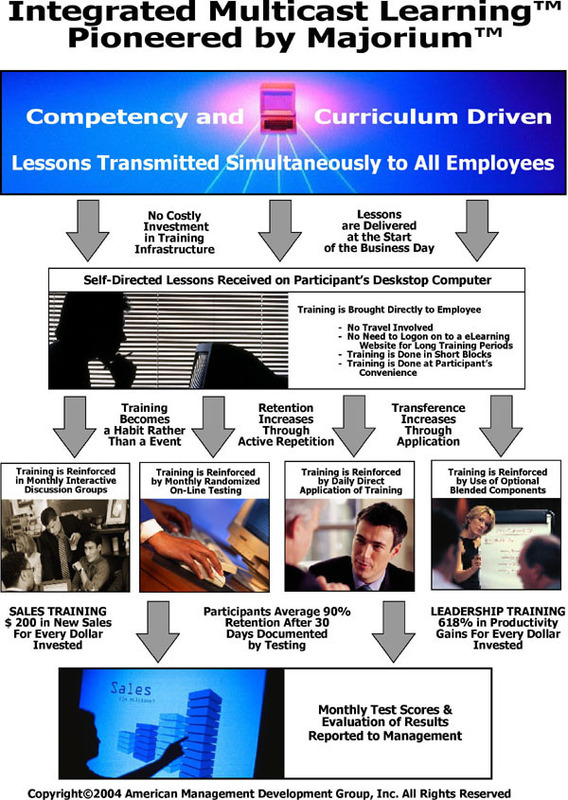 Self-directed sales training lessons are focused on single training concepts. What is taught in the morning can be immediately applied to solve problems, increase customer satisfaction and close sales. 7. The use of advanced informational architecture makes self-directed lessons easy to read, use and apply. 8. Discussion materials are furnished to sales managers to tap into sales peopleÂs synergy. Ideas are discussed and stimulated through the self-directed sales lessons. This blended training can be presented in person or can be webcast. 9. Instructional materials are furnished to sales managers to conduct interactive sales workshops that link specific training activities directly to sales peopleÂs jobs. This effectively transfers training into the field. 10. Sales people are tested on-line for both retention and comprehension at the end of each training month. 11. Testing scores are reported to sales managers. Training participants have averaged a 92% documented retention rate after thirty days. MajoriumÂs blended training is coordinated. All sales elements are integrated with each other, sharing mutual sales competencies and curriculums. Concepts are cross-linked and reinforced multiple times throughout the monthly training period. Once training is contracted, it is seamlessly delivered without the need for expensive content management and delivery infrastructures. Majorium uses common informational technology utilized by all companies, to drive training costs down. Majorium has researched and developed its innovative Integrated Multicast Learning technology to produce the results CEOÂs are demanding from their training departments. Â For every dollar companies invest in the Majorium sales training method, most average a two hundred dollar increase in new sales that is generated from the direct application of the concepts taught by the training. Sales managers who are concerned with sales peopleÂs resistance to new sales training methods, should note that sixty-six percent (66%) of training participants preferred Integrated Multicast Learning over conventional seminar training (33%) and e-learning (8%). Majorium has announced the $ 100,000 Train Your Way Corporate Training Giveaway to promote its new and innovative training technology, programs and value pricing. The Giveaway will provide training for up to one hundred (100) employees to fifteen (15) Grand Prize Winners. Sales managers, who wish to enter the $ 100,000 Train Your Way Corporate Training Giveaway, can register at the companyÂs website: http://www.majorium.com. Three Grand Prizes will be drawn each month between August and December, 2004. The contest is open to legal residents of both the United States and Canada. It is void where prohibited by law. No purchase is required and entrants will not be solicited or have their names sold. How Integrated Multicast LearningÂ Technology WorksThe blended training elements incorporated within the Integrated Multicast LearningÂ technology increases overall retention from ten percent after thirty days to in excess of ninety percent. Increased retentions translates into improved employee performance and results.